Is Apple Forcing iPhone Updates? Discussion in 'iPhone' started by ellsworth, Sep 28, 2007. It wasn't my router or anything on my end because wifi was working perfectly fine on all computers around the house. Even my PSP was working fine. I brought my phone to Work and it didn't work off of our free wifi hear either. Sooooooooooo.. Early this morning, I decided to upgrade since I wasn't getting anywhere with this. I Upgraded iTunes at my work computer and upgraded my firmware on my phone and now everything is back to normal? WHAT GIVES? I really didn't care too much about upgrade.. For all I care, I just wanted to have an old firmware with all the goodies on it. ANYONE ELSE HAVE THIS PROBLEMO? The error means something crashed on your phone, I got them all the time, until I said dont ask me again. they can force u to update yet...so i uncheck all the auto. update feaure.. I still think it was weird... Oh well. My iphone runs smooooth! 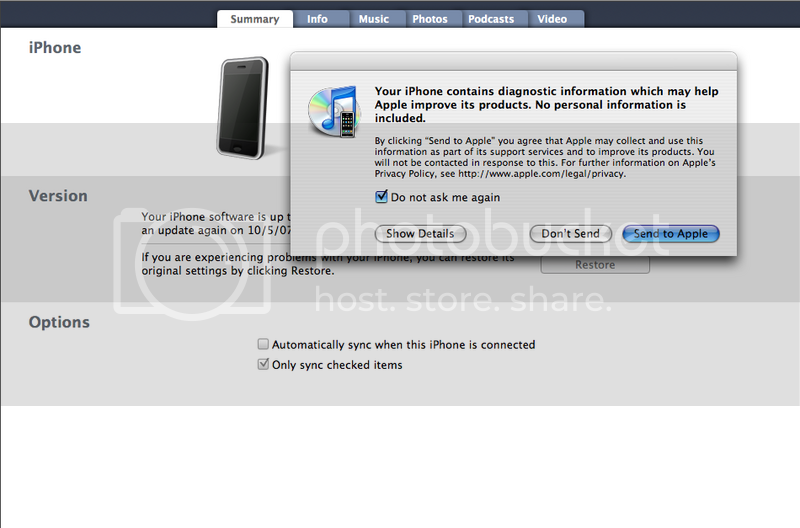 Apple can't force the firmware update on you. iTunes will notify you that its available, but you aren't forced to upgrade your iPhone to version 1.1.1. What you're seeing here is something completely different. When an application crashes on your iPhone it generates a crash log just like you would normally find in Console in OSX. Then when you sync your phone the next time, it'll ask you whether or not you want to send those crash logs to Apple (just like it does for crash logs on your computer). This picture that you posted has nothing to do with the firmware update. You probably could have done with a quick reboot to fix whatever the problem was. Stop being so paranoid - Apple isn't out to get you. Nah.. No paranoid... just wanted my wifi to work.. and was just curious... me... paranoid.... nah... I'm not paranoid... nope... not me... never.. Paranoid? pppsssha no... not at all..
Well just as long as we're clear on that.